Bay Produce began in 1986 with their first harvest of beefsteak tomatoes. 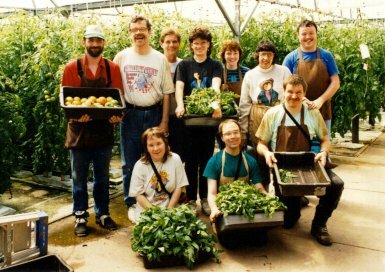 They employ enthusiastic clients with disabilities from the Challenge Center who tend to the plants as well as the system that re-captures and recycles water. In 2003 grape tomatoes were added to their production, and in 2008- red, yellow, and orange bell peppers, all vine-ripened and delivered fresh locally. Every part of the plant is utilized, with stems or plant branches composted and reused by local farmers.